In October 2018 the DfE published “Destinations Data: Good Practice guide for schools” which, as DfE guidance documents go, is a snappy publication that sets out how schools and Colleges should approach collecting destination information from their learners, the duties beholden on Local Authorities in this area, where this information is then published and how it can be used to adapt provision. The important section that I wanted to highlight for this post was the definition of “Destinations data” vs “Destinations Measures” which I had never considered before and will now endeavour to adhere to use as a definition in future posts and discussions about destinations and would hope that other practitioners join me in sticking to. This is important because, as the Gatsby benchmarks and the Careers Strategy gain momentum and Ofsted continue to inspect CEIAG provision in schools, positive destination data will become more of badge of honour to schools keen to show they are taking Careers work seriously. Differences could then arise between what a school claims is their Destination data and what is published by the DfE and then included in their performance tables as the school data may rely on leavers future intended destinations while the DfE data looks back at sustained destinations. they will be a much better reflection of the actual destinations of learners. It is important that schools do not solely use their own data to evaluate their CEIAG provision and are using Destination Measures as well as comparison between the two may also highlight useful factors (for example, if many learners where intending to secure apprenticeships but then did not or if learners from disadvantaged backgrounds were struggling to progress). It is also vital that Ofsted inspectors brief themselves on the historical trends in a school’s Destination Measures before an inspection which may show the steady progress in leavers securing more apprenticeships or other positive and sustained destinations which would reflect well on the school’s Careers work. So, from this point on – Destinations data = a school’s intended or checked leaver destination figures. Destination Measures = the DfE published figures. All Careers practitioners know that a portion of their professional skills toolbox should be dedicated to gaining an understanding of the future labour market and the winds of change that are likely to shape that market. For years, Careers Advisers and the wider education system have been accused of practicing their roles with a lack of regard of the skill demands of the business world that young people will enter into. In recent years, curriculum’s have been rewritten, qualification routes come and gone and entire new types of schools founded all with the aim of aligning education to be closer to the labour market. Careers practitioners know the barometer for the requirements of this word of work that is forever in the future is known as Labour Market Intelligence (LMI). Through the data of job growth and decline in regions, in industry areas and at qualification entry points, the future demand for certain skills, qualifications or numbers of workers can be predicted. This data isn’t always easily obtainable or decipherable for the (young) members of the public who it would benefit so it falls to Careers practitioners to be the translator and broadcasters of these resources. Sites such as Nomis, services such as LMI for All and local resources such as LEPs offer the data and practitioners determine when to use it, how to use it and what messages to amplify. We rely on the clearness of the message. If the data says that manufacturing jobs are not likely to grow in the north of England, then we paint a clear picture of the challenge facing a young person wanting to work in that area. If our local LEP is clear on the growth prospects of the nearby airport, then we work hard to get to those employers in contact with our young people to shape their employment prospects view. Facing the Careers profession today though is a very muddled picture of what is surely the most fundamental disruption of the labour market in the next five to ten years; the growth of artificial intelligence, robotics and automation across a wide swathe of workplaces. On the one hand, the prophecies of doom make for more arresting headlines and grab the attention. Consider: Last October, an Uber trucking subsidiary named Otto delivered 2,000 cases of Budweiser 120 miles from Fort Collins, Colorado, to Colorado Springs—without a driver at the wheel. Within a few years, this technology will go from prototype to full production, and that means millions of truck drivers will be out of a job. to extrapolate out disaster scenarios. That isn’t to say that they don’t consult expert opinion but the futurists they do consult are unwavering in their belief in the progress of AI. And these experts, such as Max Tegmark, MIT Professor, or Martin Ford, author of Rise of the Robots, are explicit in their advice that, not only should society and the State start preparing for the consequences of AI (through policies such as Universal Basic Income) but that children should be receiving advice on this future work space now. Other studies are reaching similar conclusions that automation and AI will fill the labour market in roles requiring logic, process or repetition but that it will be the very human skills of community building and socialisation that will still lead to in-demand employment. And that, educators and advisers, should be nurturing the skills of change management, teamwork and project work in their students to prepare them to succeed in this labour market. Other skills such as literacy or numeracy (which the current UK education system places heavy emphasis on) are also ones which will computers will (and already do) outperform humans. Almost a third of workers use these cognitive skills daily in their jobs and yet their competency levels have already been matched by computers. About 44 per cent are still better than the machines. The remaining 25 per cent have jobs that do not use these skills every day. Research by Richard Blundell, an economics professor at University College London, suggests the low-skilled tend to fare better in big companies that invest heavily in research and development. They have higher wages than other low-skilled workers and tend to stay with their employers for longer. This collaborative ideal is still a fundamental change in the labour market due to the numbers of low skilled roles that will be affected. The question remains on the scope of this new market to soak up the displaced and provide employment at the levels we see today. And that Governments should act upon the things they can control. If the capital and resources gained by technological progress is more fairly redistributed by the State, then the offsetting factors of commercial expansion and growth would provide new employment opportunities elsewhere in the labour market. The pool of employment opportunities would change shape but not drastically shrink. In this scenario, Careers Advice becomes a sign poster of the future jobs such as Drone Traffic Controller or Augmented Reality Designer. Here, the faith is placed in the churn of technological progress and investment in new areas of business to bring new jobs to replace those lost to automation. Economies with high levels of automation such as Germany and Japan have strong job growth. The percentage of people in full-time work in the USA and the UK is growing steadily. In short, there just isn’t any evidence that AI is effecting the jobs market. would plan opportunities for clients to grow these capabilities. Which is all work Advisers would be happy to cover and would provide clients with enriching learning experiences but what strikes me is the fact that the profession is tasked with preparing for this wide range of eventualities. The lack of clarity from both Governments and Business voices on the shape of the future labour market is unhelpful. The Business lobby is not shy on coming forward with the skill demands they place on education and CEIAG to meet more definitive labour market needs. Whether looking at the strategic needs of nation economies or drilling down to an oversupply of graduates from a particular vocational area, Business leaders are clear on what they require from education. For such a large disruption potential to employment, the lack of clarity on what we should actually be expecting is noticeable. The type of preparation work outlined by Professor Hooley would be much better served alongside as clear guidance from business leaders on what will likely be the reality of the impact of AI and automation on the labour market. Exams are looming and the summer break is peaking over the horizon so nobody working in schools needs anything extra to do but I’m going to make a suggestion of something that CEIAG leads should consider getting sorted if not before the end of term, then very quickly in the new academic year. That job is writing, consulting with Senior Leadership on and then publishing on the school website the school policy on other educational and vocational providers speaking and presenting to your cohort of students. The Technical and Further Education Bill received Royal Assent and became law on 27th April 2017. The core purposes of the Bill are to lay out the regulation and authority of the new Institute for Apprenticeships and create a new insolvency process for Further Education Colleges that navigate themselves into tricky financial waters. It is though one of the Amendments to the Bill, requested by Lord Baker (joint founder of the Baker Dearing Educational Trust which facilitates the opening of new UTCs) that requires attention from CEIAG practitioners in schools. (CEIAG colleagues in FE Colleges will be more concerned by another Amendment which now requires that Ofsted specifically comment on Careers guidance when publishing their reports on FE providers. I don’t know why this required statute and could not be achieved through Ofsted’s own guidance to inspectors similar the requirement to comment on Careers provision in secondary schools). And it this job that needs completing as soon as possible. All good CEIAG schemes in schools will include plenty of input from vocational and apprenticeship providers and, ever since starting this blog, I have been wary of the Vocational training sectors rote complaint that “students don’t know we exist” as an over simplification of the complicated reasons young people follow routes with clearer directions of travel and fail to secure apprenticeships, despite registering and applying for them in huge numbers (compared to vacancies), yet a cliché is a cliche for a reason. Everyone working in Careers in schools has heard eyebrow raising tales of Sixth Form managers escorting FE College visitors out of the school reception, prospectuses going missing, Apprenticeship providers being put in a classroom to talk to only a “select” group of students and so on. As Lord Baker himself has noted, the introduction of providers such as UTC’s who admit students at 14 into a system unused to this competition for funded students complicated local issues so providing a clearer set of guidelines while still allowing local flexibility would seem a solution looking from the top down. The downside is that it can result in unnecessary bureaucratic hurdles. Tackling the issue from the ground up, practitioners and colleagues will already know that solving these issues best comes through the relationships built from local collaboration and transparency, strong local progression networks and the buy in to a shared vision for positive student outcomes in a regional area. Where this isn’t the case though, some Vocational and Apprenticeship providers (and Vocational professional bodies will be doing their utmost to inform their members) will be approaching schools in the new academic year expecting a policy document to be in place. Yet any school leaders will also be wary that these requests come at unsuitable times for learning or assessment preparation, they might clash with a multitude of other events such as school photos, leavers assemblies, trips, other booked visitors and so on. 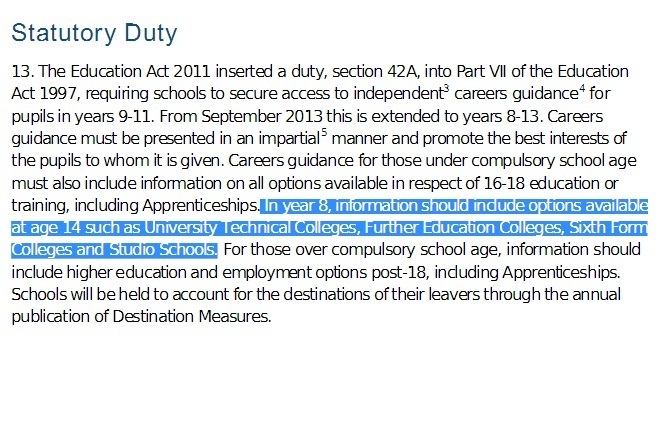 This provision needs to part of a planned scheme of CEIAG work for year groups and cohorts so having a clear policy published early will help deal with multiples of requests and also deal with any members of school staff still sticking to outdated ways of working when responding to other local providers who enrol at 14 or 16. As part of X school’s commitment to informing our pupils of the full range of learning and training routes on offer to them, X school is happy to consider requests from training providers, Vocational education and apprenticeship providers to speak to students and will also approach these partners ourselves when planning organising key Careers events throughout the school year. These events provide ample opportunities to speak to students and parents both individually and in groups to offer information on vocational, technical and apprenticeship routes. These are usually held in the school hall and timings, facilities and parking and registration details are emailed to exhibitors in good time before the event. Enquires about these events can made to school X’s CEIAG lead at the email address below. We also have a number of whole year group assembly slots which offer providers a short opportunity to quickly spread the word about their offer. These are 20 minutes slots to a whole year group of around 200 students in our main assembly hall which has a whiteboard projector and speakers for sound. These are usually on offer through the early part of the Autumn and Spring terms as, at other times, our halls are used for exams and so assemblies do not take place. If you are a provider and would like to enquire on the availability of assembly slots please email our CEIAG lead on the details below to request a CEIAG visitor booking form and complete the assembly request section. If a provider is unable to attend these events or feels that their presentation needs require different circumstances or that they are hosting an event they wish to promote, in the first instance they should contact CEIAG lead at X school ????? via email ????? @xschool.co.uk and complete a CEIAG visitor booking form. The CEIAG visitor booking form asks for the role of the training, vocational or apprenticeship provider you represent, the aim of the presentation, if the request is for an assembly slot, the number of students the presentation or session is designed for, the length of the talk or presentation, the target year group for the session or presentation, what display or other facilities the session would require, how many provider staff (and names of staff) that will be visiting and what support from school staff you would require on the day. If the email is notification of an event at an off site venue, please include timings of the day, a list of other invited schools and providers, any accessible funding streams for transport costs and a visit risk assessment of the venue. Responses to requests will come from the school CEIAG lead. For requests that are approved, School X will provide clear instructions before the event on visitor parking, visitor registration, a contact member of staff and their contact details, the teaching room or school hall to be used at the session and the presentation facilities this space offers. As part of School X’s wider CEIAG policy, the range of Careers provision for students is reported every academic year to the school governing body and Headteacher. That may seem an overly officious document which would probably elicit a weary sigh from a colleague at a vocational provider wishing to visit schools but that includes all of the information the new Clause requires from schools. I’d be interested to hear your thoughts, comments and suggestions in the comments below. For both schools and Vocational training providers, navigating these policies may provide clarity on how to gain access to each school in their area but it may also be a spur to improve on the local relationships and networks mentioned above that are he real solution to this issue. As, I would imagine, most readers of this blog would be aware, Secondary schools in England have a current statutory duty to provide CEIAG on all routes to their pupils. Despite this, Vocational and apprenticeship providers and policy lobbyists are making loud noises about the need for further legislation in this area. It was around this time last year that a Careers law was first mooted that would ensure that Vocational and Apprenticeship providers would have access to schools to provide guidance to pupils. At the time I blogged to point out that, if schools, Ofsted and the DfE were all performing the roles the Duty placed on them, then no further legislation was necessary and that any further law was an indication of failure of the system of statutory tools to lever change in a fragmented school system. This law founded with the failure of the Government’s wider “Education for all” Bill which hit the rocks of the Brexit vote, a reshuffle and opposition to forced academy status. The actual wording of the Bill (page 2, section 2) seems comprehensive. It places a requirement on schools to write and update and publicly available policy statement that sets out the circumstances under which vocational providers will be given access to students and for what reasons such requests could be refused. I would assume, that the writing of this statement and subsequent responding to requests would then be an administrative task for the school careers leader and line manager to manage. The bill is currently passing through the House of Lords before passing back to the Houses of Parliament for any amendments to be confirmed before Royal Assent. Lord Baker has more than a passing interest in this area as the leading proponent of the UTC school model which has experienced huge difficulties in recruitment of students at both 14 and 16 and been branded as failing by Micheal Gove. That brought a forthright response from Baker but he is clear about the need to ensure recruitment (and so subsequent per pupil funding) is much easier for his Headteachers. Baker foresees his clause forcing schools to hold career events (read: fairs) to allow Vocational providers to speak to students at key recruitment times throughout the academic year. My Bill will ensure that school pupils have access to information from the providers of post-16 pathways locally direct to them. It will require schools in England to provide access to their premises and pupils for post-16 education establishments and other providers. The wording of the actual Bill isn’t clear on how this would be different and, at the time of writing, it has far further to travel through the legislation process until it becomes part of the Education Act 1997 and so law. This Bill does have more support from the wider FE sector than Baker’s clause and is not tainted by association of the accusation of only trying to save the struggling UTC brand so, perhaps, will gain wider support. To further complicate matters, these competing acts of legislation coming on top of an already existing statutory duty will soon be joined by a new, overarching, Careers Strategy sometime in 2017. As well as the complications arising from overlaying legislation, many Careers practitioners in schools will be raising their eyebrows at the problems this doesn’t solve. It doesn’t solve the funding issues, it doesn’t solve the capacity issues and, furthermore, the rhetoric around these Bills aligns access to vocational talks as the white knight, riding in to save school CEIAG provision. The updated Careers Guidance has been out for a few weeks now which is long enough for it to be read, digested and (in some cases) spat back out by those with an interest in these things. The initial media coverage concentrated on the clear desire in the document(s) for schools to be much more proactive in their approaches and collaborations with the business community to provide the much vaunted and discussed “inspiration” that will illuminate the clear routes ahead of young people on their paths to success. Or something. What gained less attention was the inclusion of instructions for schools which, arguably, could require a greater amount of change from them. The difference between the two excerpts could not be clearer in the detail covered or the expectation placed on schools. Or to be more precise, the expectation placed on Careers leads in schools. We now can’t hide away from the fact that we are the forefront of the growth of the marketplace for students at 14 and our requirements to spread IAG may cause disquiet and unease among colleagues and ripples through our local educational landscape. I would imagine, in most schools, it’s something that needs airing with all of our Senior Leadership teams explicitly and soon. The issues Studio schools and UTCs have previously encountered with enrolling students have already been noticed by both the national press and the Ministerial team writing the checks so in response, some of these individual schools have been pushing their marketing boat out with focused, local campaigns whilst being supported by a national presence with substantial PR nous and which herald the positive employability skills gained by their alumni. In some areas, this marketing push hasn’t gone smoothly and, I must admit, I’m surprised there hasn’t been more coverage of localised political shenanigans resulting from these transitions (if I’ve missed any, please let me know in the comments). If I was the Head of a newly or soon to be opened Studio School or UTC I would be sending that second image above to the Heads of all my local secondary schools with an offer to come in and run an assembly. Of course, not all of those offers would result in collaborative work but schools who refuse or ignore those requests are on much more shaky ground should Ofsted arrive and ask the questions they should be asking. 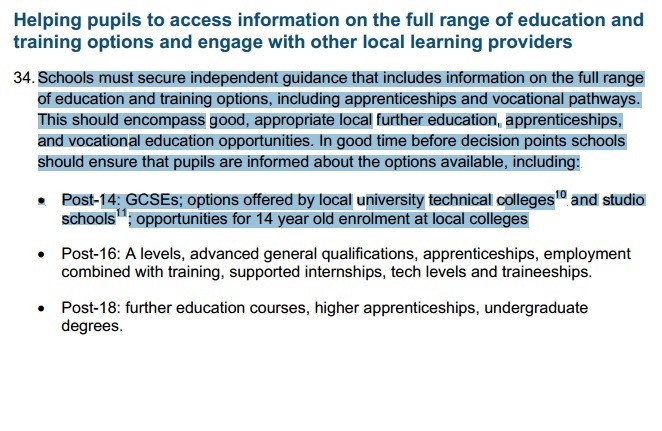 There will be Careers Leads in schools who may be reading this and feel content in the knowledge that a UTC or Studio School is not due to open near their patch. They would be wallowing in the relief that I feel when speaking to Colleagues who work in schools with Sixth Form provisions about the long running and well-known battles had about introducing other routes to students at the 16 transition point. Well, I’d hesitate to feel totally at ease yet because, included in that second image, is the line “opportunities for 14-year-old enrollment at local Colleges” and with the funding squeeze being felt by Post 16 providers it’s not difficult to imagine many more of them looking into establishing provision at 14 to both shore up funding and subsequent enrolment at Level 3. This is an issue coming all our ways.